A prolific and beloved live act, with over 200 shows a year since their inception in 1996, Red Wanting Blue are nothing short of breathtaking when they're on stage! 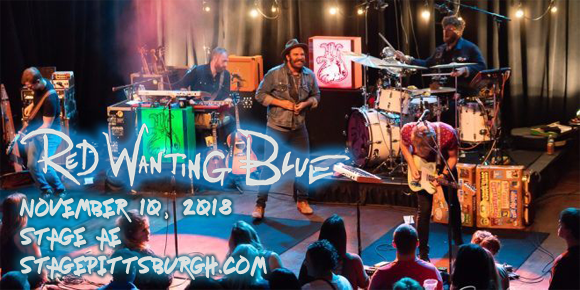 Coming to Stage AE on Saturday 10th November 2018, the group are promoting their upcoming twelfth studio album The Wanting, so fans can look forward to some hot-off-the-press new material from these phenomenally talented Midwestern rock and rollers! Formed by singer-songwriter Scott Terry in 1995, Red Wanting Blue are an American rock and roll band, based in Columbus, Ohio. The group released its debut album, Velveteen, the following year, but it was their third studio album, Model Citizen (2000), that proved to be their breakthrough. Their ninth studio album, From the Vanishing Point (2011), debuted at number 10 on the Billboard Heatseekers Chart, leading to appearances on the Late Show with David Letterman, CBS, VH1's Big Morning Buzz Live and NPR's Mountain Stage. The album that followed, Little America, debuted at number three on the Billboard Heatseekers Chart and number 31 on the Billboard Mainstream Rock Chart. Their twelfth studio album, The Wanting, is to be released in 2018.